Santa Claus is back, but not quite as we may remember him. Relaxing in a hot tub filled with coloured “baubles” and strutting his stuff under a spinning disco ball at the office party, he returns this year to feature in 12 of the 16 Christmas windows in Selfridges’ flagship branch on Oxford Street – London’s busiest shopping street – which are unveiled on Thursday. 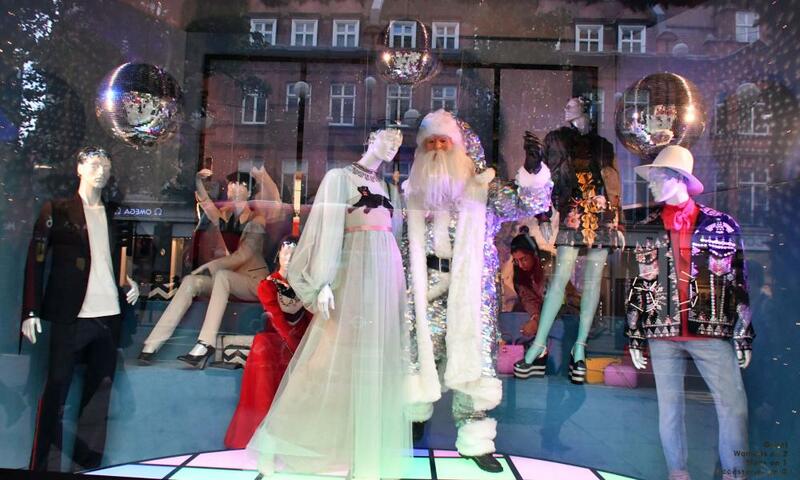 Launching its festive windows and in-store decorations – which include cannons firing confetti and glitzy giant baubles as well as an expanded standalone “Christmas shop” – the retailer cannot be accused of understatement. Every smiling full-size mannequin wears a custom-made Santa suit featuring 6,000 large red sequins (manufactured in Hong Kong) and handstitched by a team of six people in Bali. 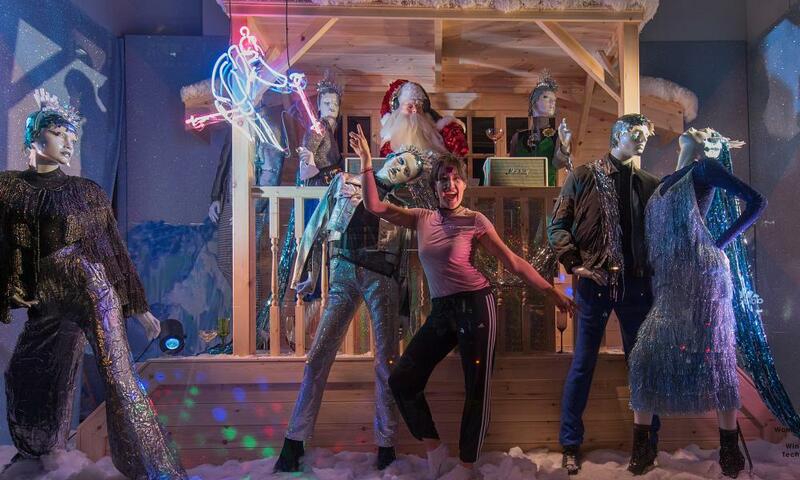 Also for the windows, Selfridges’ in-house creative team has sourced specialist ski equipment – including a vintage skidoo – from a reclamation yard in the French Alps to create this year’s much-anticipated Christmas theme. Each window showcases a snowy Alpine landscape and different party scenarios, where family, friends, pets (from poodles to bambis to giant Polar bears) – and even a snogging couple at the office party – all join in the fun. 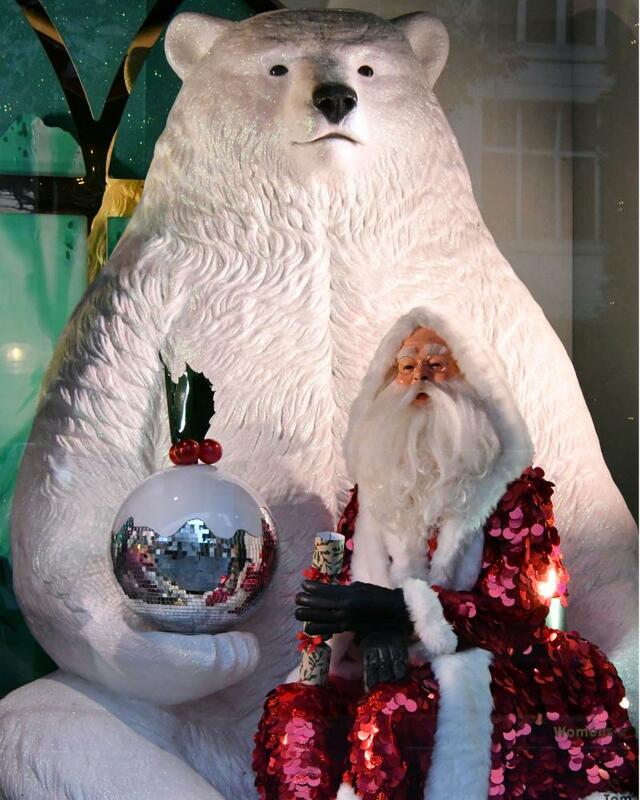 The last time Santa was the central theme – appearing in each window – was in 2009, when the displays were hailed “the more the merrier”. One of many high-end London retailers whose takings have been boosted by the influx of international tourists taking advantage of the slump in the pound, Selfridges hopes the tills will continue to ring as the shoppers pour in over the festive season. The sudden currency depreciation triggered by the result of the June referendum vote has left sterling hovering at its lowest level against the dollar for more than 30 years. This has turned the UK into a relatively cheaper destination for millions of foreign travellers wanting to shop for luxury goods. Late last night, the in-store creative team pulled back the vinyl on Oxford Street – as some windows were still being completed at the 11th hour – to the bemusement of passersby. 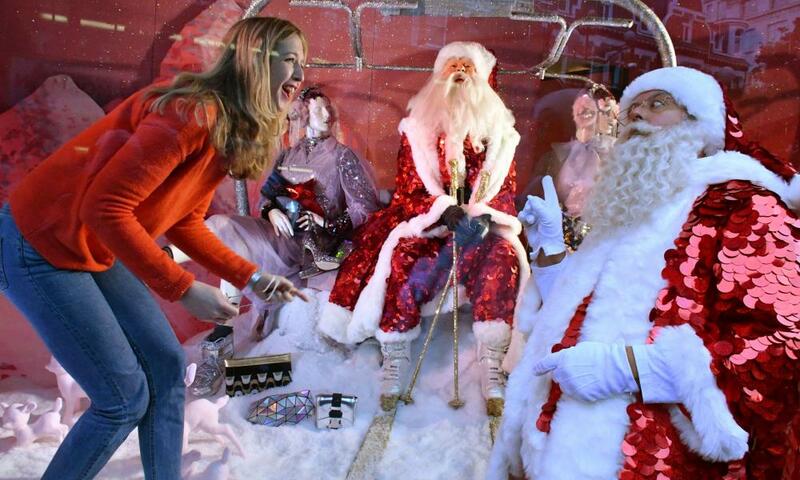 A full-sized silver glitter-encrusted ski gondola – which had been 3D-printed – was wheeled into in a front window, awaiting Santa and his ski chums. Nearby, an enormous “faux” fir panel of foliage was carried by a JCB on to the pavement and winched into place by a team of contractors in hi-vis waistcoats. The materials in the backdrops of the windows – which have a pink and blue colour scheme – range from glittered acrylics, iridescent snow, gold lamé, pastel sheepskins and super-soft velvets. The theme was agreed more than a year ago as the process of producing the Christmas displays and windows – from initial ideas to sign-off and final reveal – can take up to 15 months to complete. Selfridges’ dedicated Christmas shop – selling decorations and stationery – launched in August, but will double in size when it opens fully on Thursday. The sparkling theme – also echoed in its Manchester and Birmingham stores – involves 114,000 Christmas baubles strung from balconies and ceilings and more than two tonnes of glitter. Inside the central atrium, 10 giant coloured disco balls – ranging from 1.5 metres to 1.7 metres in diameter and the largest it has ever used – will rotate and move and up and down, thanks to more than 100 metres of electric cabling. For the first time the store will set off confetti cannons every day, which will release 64,000 bits of paper on to surprised shoppers. In addition, a whopping 3,000 metres of iridescent film will be used, 1,800 star decorations across the London store and 1,500 metres of garland on escalator handrails. The biggest triple-sided window at the corner of Oxford Street and Orchard Street features a giant silver chrome party popper with a specially commissioned multicoloured neon installation instead of confetti. Selfridges’ Christmas installation – slightly earlier than last year but still before the switching on of the Oxford and Regent Street Christmas lights on 1 November – will be in place for “65 days plus” – up to and probably beyond the start of the traditional Boxing Day sale. Harvey Nichols is due to unveil its Christmas windows in early November followed by John Lewis, which will again link the theme to its hotly anticipated Christmas advertisement. Despite ferocious competition in the retail sector there is a “friendly rivalry” over the Christmas “reveal”, Emslie said. “We certainly like to see what everyone is doing. Last year there seemed to be a bit of a zodiac and space theme going on,” she said.